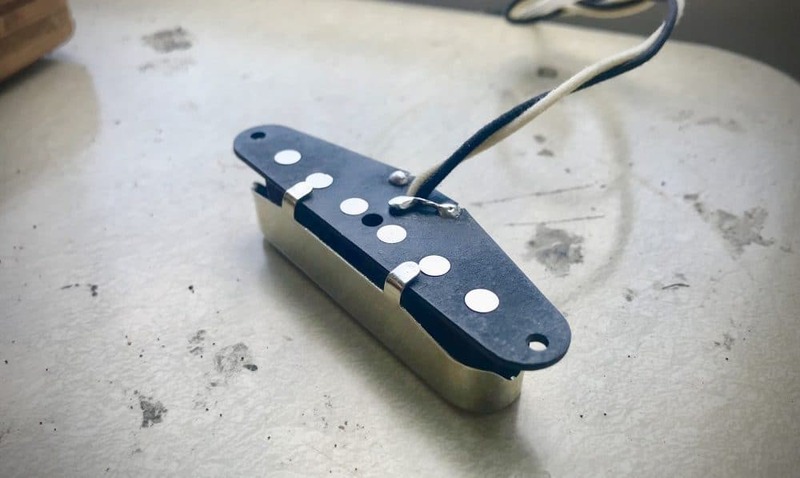 Due to the popularity of 4-Way Switching, we get asked a lot about converting a standard Telecaster Neck Pickup into a 3-Wire Neck. 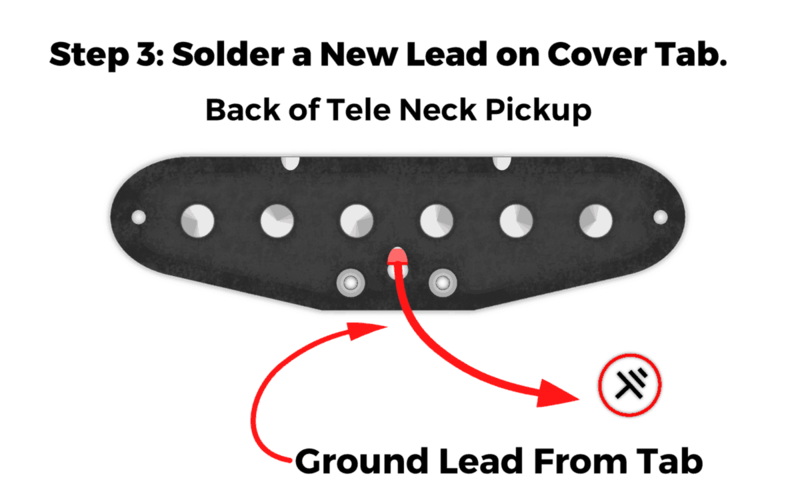 In today’s lesson, we’ll show you how to convert the Neck pickup to work with 4-Way Switching. Please note the only time you need this Tele Neck Conversion is when you have a metal cover installed. If you don’t have a cover, you don’t need to perform this modification. Your pickup has two leads: White for hot, and Black for ground. 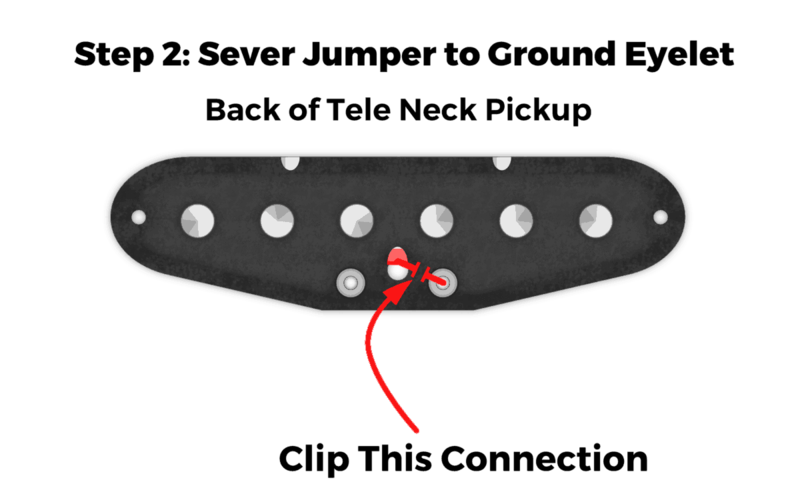 If you have a cover installed on your neck pickup, your cover has a jumper going to the Black lead. This sends any unwanted noise picked up by your cover to the ground. In 4-Way Switching, you need to separate this connection for the modification to work. Locating the jumper is pretty straightforward. Carefully remove the pickup from the guitar, and turn the pickup over to expose the back of the Neck Pickup. If you have a cover, you’ll see the jumper connecting the cover to the ground (black lead) eyelet. This is the connection you’ll need to sever in Step 2. After identifying the jumper, use a pair of wire cutters to clip the metal connection between the cover tab and the Black lead eyelet. The cover and the coil is now separated, and we can proceed to Step 3. Now that you’ve severed the ground connection, we need to run a separate connection to ground the cover. You can use any insulated lead to do this, but Fender Cloth Lead tends to work best. Push back the cloth insulation around the wire and apply the lead with a bit of solder to the tab of the cover – any tab will do. You have now converted your neck pickup into a 3-Wire Neck. This allows you to run the White and Black leads to the 4-Way Switch, while grounding the Cover. You’ve now just sucessfully performed the Tele Neck Conversion. Now What? Take a look at our article that provides an in-depth explanation on 4-Way Switching and how to wire it up. Good luck! ← 8 Common Guitar Pickup Rookie Mistakes! May a ground lead mod be done to your tele split blade pickup? 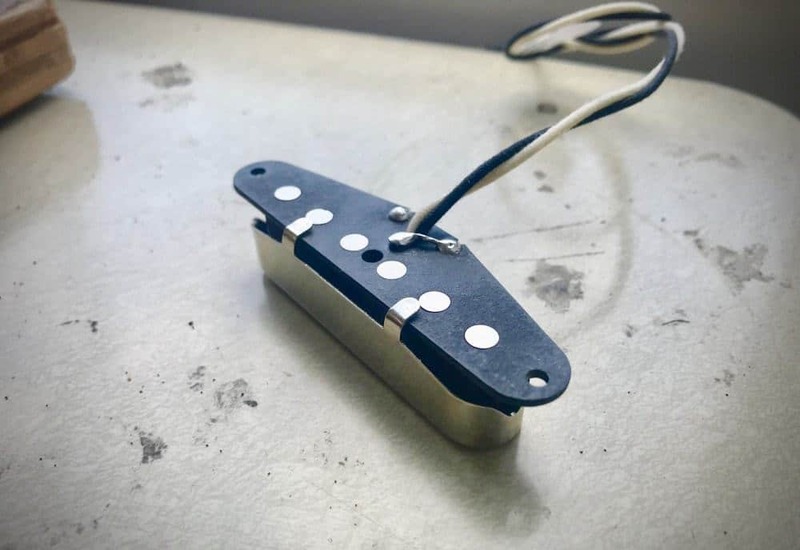 Yes – it’s done the exact way as a normal Telecaster Neck Pickup. Where can I find your in-depth article on Tele 4-Way pickup switching ?